We like to meet with our students to discuss their assistive equipment needs. It's helpful for us to have some background information about you to find equipment that fits your needs. To request assistive equipment, set up a consultation by contacting Jane Fridrich at jfridrich@wlu.ca. Once you work with your ALC consultant and the assistive technologist, you will see the equipment you have checked out in the system. Choose "Equipment Checked Out" under the "Home" left-hand navigation. 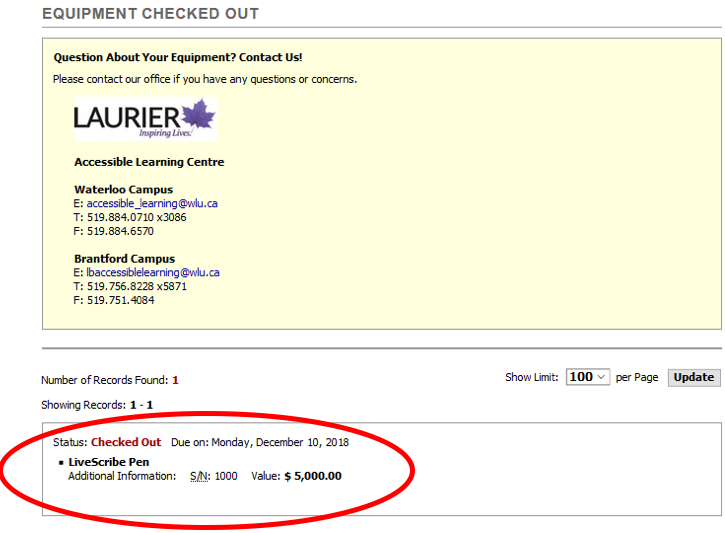 The equipment you have been provided will be listed on the "Equipment Checked Out" page. On the Waterloo campus, our ScotiaBank Assistive Technology Lab is located in the Arts Building, room 2C7. The lab is open Monday to Friday from 8:30 a.m. to 4:30 p.m.
On the Brantford campus, the Assistive Technology Lab is located at 97 Dalhousie St., room 105. To inquire about lab hours and/or request FOB access outside of regular hours, email lbetext@wlu.ca.